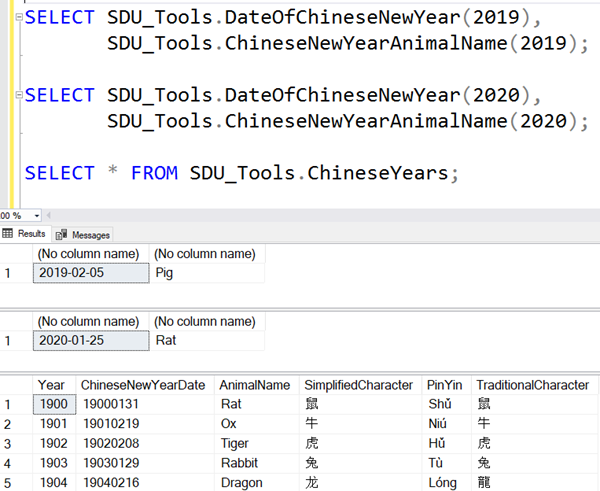 To celebrate Chinese New Year this week, I thought I should write about some options that we recently added to our free SDU Tools for developers and DBAs, for working with Chinese calendar concepts. Let's start with the basic one: when is Chinese New Year? We added a function called DateOfChineseNewYear. You just supply our year number (Gregorian calendar), and it will tell you when Chinese New Year is. You can see it in use in the image above, along with the much more cute function that tells you what the Chinese Zodiac animal is for the year. It's called ChineseNewYearAnimalName. So next year (2020), Chinese New Year is January 25th, and it will be the year of the Rat. These functions all work for years 1900 to 2099. Next Next post: Learning Mandarin: The curious word "le"